After record rainfall this year, we had a teaser of spring last week. We wore shorts and skirts over here in San Francisco. We had a couple of picnic lunches in soft spring sunshine. We took a lot of long walks (well, we do that in the pouring rain too because of the crazy German Shepherd mix). We ate ice cream at two of my favorite spots. Well the temperatures have fallen again and it’s cold and wet. Perfect for soup. 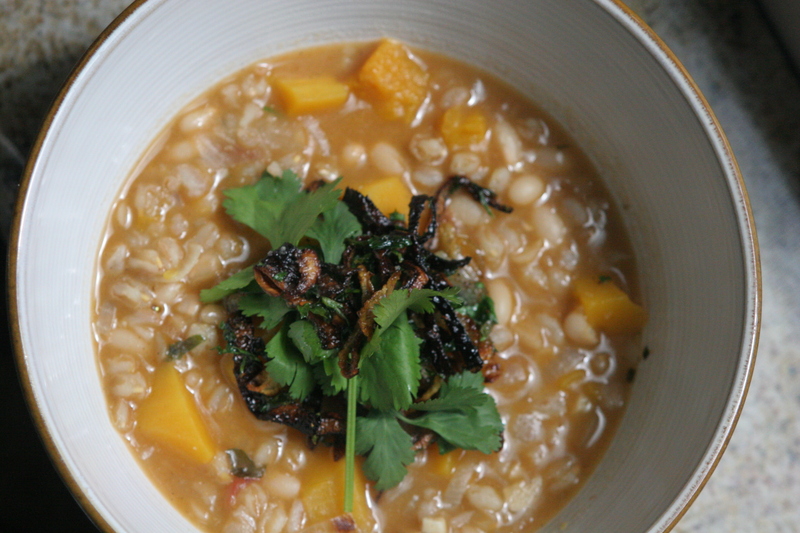 This soup is Moroccan-inspired in the pumpkin, spicing, and garnish, but also contains Italian beans and farro. It’s quick, hearty enough to serve as dinner, and rich in umami flavors from the tomato and fried shallots. Be sure not to skimp in the spices as they round out the flavors of otherwise quite simple ingredients. The most important part of the soup is the garnish. If you have ever made Indian daals, many of them rely on spices and/or garlic fried in ghee and then spooned into each bowl of soup. Many Northern African stews and soups are similar. For this soup, you add sliced shallots, toasted ground cumin, and chopped parsley and mint to hot olive oil until the shallots become crispy and the spices fragrant. Spoon a large helping into each bowl and add some fresh cilantro sprigs and you have an interim soup to get you from a prolonged winter to tardy spring. 1. Heat 3 tablespoons olive oil to medium and add onions and garlic. Fry for about 10 minutes, stirring occasionally. 2. Add farro and stir to coat. Add the tomato paste or tomatoes and cook for 1 minute. Add approximately 6 cups of water (or broth) and stir to cook for 30 minutes. 3. Add chopped pumpkin/squash and beans, allspice, cinnamon, and 1 teaspoon of the cumin to cook for another 15 minutes or until pumpkin is cooked to the texture you prefer. (I like firm enough that it is not falling apart, but still has individual pieces.) Add salt to taste. 4. Heat the remaining 3 tablespoons olive oil to medium-high. Add all the sliced shallots and cook until they begin to color. (I sometimes separate the rings with a fork, being careful not to burn myself in the hot oil, it allows them to get perfectly crispy.) Add the last teaspoon of ground cumin, the parsley and/or mint, and the cayenne pepper, if using. Fry for another minute and then remove the pan from heat. 5. Taste your soup to check the saltiness and then ladle into bowls, top with a very generous spoonful of the shallot-spice garnish, several sprigs of fresh cilantro, and serve. This entry was posted in Legumes, Soup, Vegan, Whole Grains and tagged farro bean pumpkin soup recipe, Moroccan vegan soup, vegan soup. Bookmark the permalink. This soup looks so hearty and delicious. And you’re right – a good garnish absolutely makes a soup! If one does not have farro on hand, what would be a good substitute? Barley? I finally got to make this yesterday and it was a real treat. The seasoning was perfect. 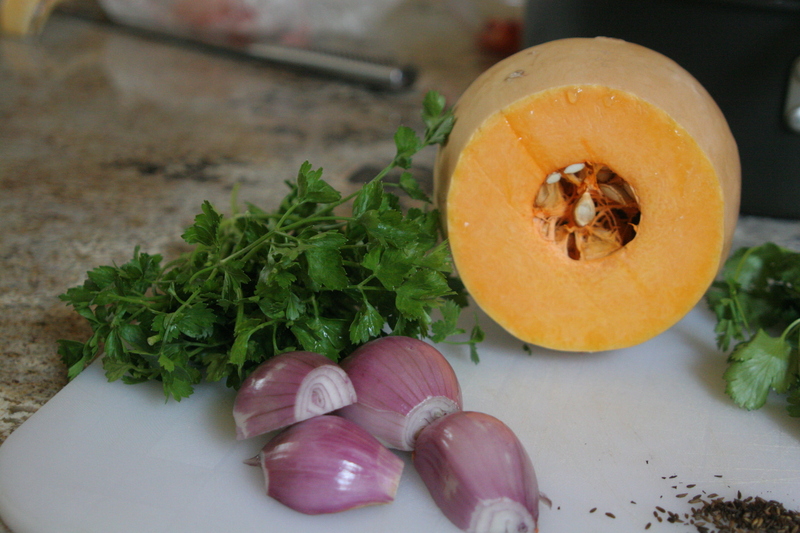 I’ve made butternut squash soups before that are lacking in flavor. Not this one! And you’re right, the garnish makes this dish even more special. I’m going to have to remember that in the future. I am so pleased to hear you liked it. Ever since I got Kim Boyce’s baking book last year, I have been thinking about using whole grains and their flours in just about everything. If you like farro, try spelt flour. It’s the same thing and actually pretty popular in southern Italian pastas. Thanks for commenting Laurie! I’m working on your cookie with corn flour still.